2015-19 Mustang GT headers with 1-7/8" primary tubes, 3" diameter lead pipes and high flow catalytic converters designed to connect to an Unholy Union. Tig welded 304 stainless steel headers with 3/8" thick flanges and 3"
diameter slip fit collectors with merge spikes. 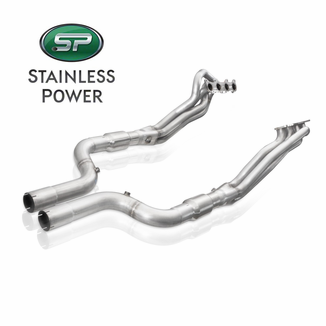 This system is designed to work with Stainless Works 2015-19-17 Mustang aftermarket connect exhausts, which include MBRP, Corsa and SW Factory Catbacks. 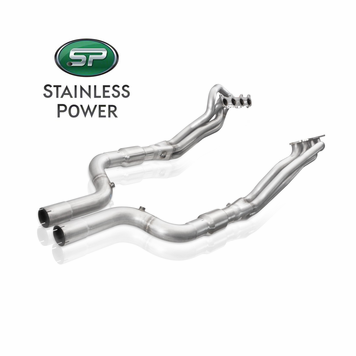 Our Stainless Power headers are backed by a 24-Month guarantee on material and workmanship.